January 28, 1547. It is almost midnight, and the cream of English nobility hold their breath as King Henry VIII prepares to face his God. As the royal physicians wring their hands and Archbishop Cranmer gallops through the frigid night, two dispossessed princesses pray for their father's soul, and a boy, soon to be king, snivels into his velvet sleeve. Time slows, and dread settles around the royal bed, the candles dip, and something stirs in the darkness...something, or someone, has come to tell the king it is time to pay his dues. 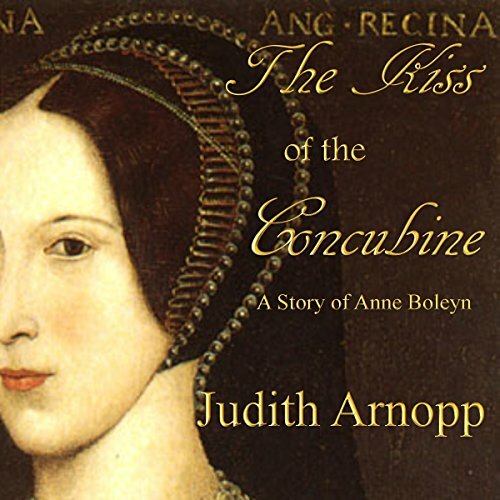 The Kiss of the Concubine is the story of Anne Boleyn, the second of Henry VIII's queens. This author does a wonderful job bringing Anne to life. I couldn’t stop listening and finished this book in a day and a half. All Tudor fans will enjoy this one, especially the way it begins and ends- with Henry on his death bed... no spoilers of course. I’ve listened to every Tudor biography and much of the relevant historical fiction available on Audible. From a young age, I’ve been captivated story of Anne Boleyn. The nearly decade long love story that ends so quickly in her murder, only a few years after they finally were married. I don’t believe for a second that Anne was guilty of adultery, yet it has always haunted me that the king could behead her and so many of his own close friends on false evidence. With this in mind, the author note and conclusion at the end of the book was very intriguing, as she states that there’s new evidence which sheds light on this very issue. I’m hoping that new histories and/or biographies will come out soon that sheds light on the new evidence! For anyone who loves Tudor History, this is a must!!!!! Especially if you are interested in a first person account of Anne Boleyn. This maybe fiction, but it has some interesting historical qualities that makes this story completely absorbing. I enjoyed this take on the rise and fall of Ann Boleyn. Good narrator. Good story. struggled a bit with the performance. The narrator doesn't sound as a young vibrant girl but sounds much older - therefore difficult to invision Anne Boleyn. King Henry destroyed a life. Wonderful history and pure excitement in story . Voices and accents amazing and draws you in. This is a well-crafted book giving some very different but highly credible insights into Anne Boleyn's life. Alex Lee gives a sensitive and often moving narration, and I found it hard to stop listening - the equivalent of not being able to put down the book! I’ve read many accounts about Ann Boleyn but this is the best so far. Told in the first person Lee’s voice with its subtle French accent brings the story and Ann herself to life. The author has successfully created plausible psychological truth within the characters of Ann and Henry as well as the other key characters in this tragic story. Nothing wrong with the story of course. One of the most dramatic in English history. however the telling of it was a bit lack lustre. I suppose when you're going in to bat against Hillary Mantel. Its a tough number. I felt that some of the facts were a bit like warmed over pizza - just rearranging them didn't make it compelling, or incisive, or exciting. When Anne was in the Tower - would she really be bothered about Henry not being there to kiss her 'duckies'. Personally I think not. Still, if you like that sort of thing. I can imagine some people would find the book enjoyable. I certainly couldn't write anything as good. so well done! I thoroughly enjoyed this story, so much so that I didn't want to switch off. It was well read and I couldn't help but feel sorry for her at times. I really enjoy this type of historical novel, so it was perfect for me.